← ﻿Dinner Xi’an – Feb. 16, 2018 – Beverly Hills, CA. February 21, 2018 – Dinner – Montresor – Studio City, CA. In a very hipster strip on Ventura Blvd., right across the street from my Gym, is the best French restaurant in all of Los Angeles, a hidden gem amongst lots of well-known establishments. But look no further; this is the place to go to try a new take on luxurious French cuisine. Lisa Long is one of the owners; she was the same gal that helped me with my culinary journey at The Flats in Beverly Hills. She is very hands-on, making sure every part of your experience will be excellent. 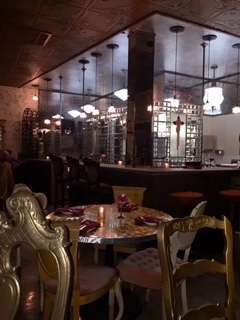 The new Studio City spot, only in operation for a week, is brought to us by co-owners Lisa Long (who’s also a partner in La Loggia Ristorante and the Flats), and designer Ann Booth Luly, who conceptualized the space. Designer Ann Booth Luly also owns the retail store Hoity Toity in Studio City; she did a remarkable job of making the interiors elegant, whimsical and friendly. The interior is filled with lots of Art Nouveau/Louis XIV accents and furniture. There are different chairs at every table, Edwardian, Victorian, Rococo and every single one unique and individual. Not overdone, but very tasteful, there is a lot to look at. Michelin-Star Chef Paul Shoemaker is at the helm, “I like to take a classic dish and have a little fun, give it some flair and get playful,” Shoemaker says, “I want to create something different, that stands out amongst the classics.” For now, the menu is a brief list of 15 or so items, total, but there will most likely be more to come. Trained in the kitchens of Chef Thomas Keller’s French Laundry, and Per Se, as well as Alain Ducasse. Shoemaker has brought technique-driven cooking and a Southern California sensibility to Providence, Water Grill, his own Savory, and Firefly, not to mention, Joe Pytka’s Bastide, where in less than six months he earned a Michelin Star, classic-meets-modern French. 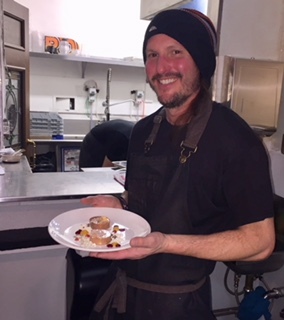 I tried his lovely food at a tasting at INTRO Art Gallery & Chef’s Table, a while back and was extremely impressed, described as a multi-course sensory explosion. A different venue; but the same attention to detail and enjoyment in every bite. I also recognized host James Saliba from La Loggia Restaurant, he made everyone feel completely at home. They give you a lovely bread plate with Black Truffle whipped butter and these very small but mighty rolls that have more truffle and butter inside, yum! French Onion Soup with Gruyere, and baguette croutons, a bit on the sweet side, but truly an amazing rendition of my favorite French soup. The cheese and croutons add to the overall wonderful experience of this creative soup. Foie Gras Torchon, Black cherry, Moscato, and brioche. Ok, this is not an appetizer; this is an event. All of the little fruit jellies and sauces that accompany this Foie Gras. I had this with my champagne and every bite just melted in my mouth. Wow, truly outstanding. So happy that Foie Gras is back on everyone’s menus, for a while it was illegal to serve in California. Crab Cake with Meyer lemon gastrique, remoulade, and frisee. The crab cake itself is so flavorful, with very meaty fresh crab, and the remoulade sauce was incredible. Rhode Island Black Bass, with Artichokes, tomato, and saffron jus. The fish is tender and moist with the wonderful saffron jus, this is a keeper. Lamb Loin, with mixed grains, bloomsdale spinach, and Cipollini onions. The lamb was served medium rare, each bite was soft and delightful, no need for a knife it was just like butter. Sensational!! Butterscotch Panna Cotta with Expresso ice cream, and almond brittle. The perfect flavor profile for me, especially with the butterscotch and almond brittle. I just loved this desert. Mixed Berry & Honeycomb, Pistachios, and Chantilly cream. This is a very decadent way to eat berries, but so fantastic, a great end to my beautiful experience. Ascension Silver – Blend, Napa, I loved this wine with the crab cake, it was not over powering, a nice pairing. Franciscan – Chardonnay, Napa, this is my kind of wine, filled with buttery goodness. This wine should be paired with the Bass; it lends itself to the nice saffron jus. Upper Cut – Cabernet Sauvignon, Napa, this wine took me very much by surprise, with its creamy chocolate taste, it was so delicious with the lamb. Seghesio Family Vineyards – Zinfandel, Sonoma. I used to be a wine club member, they have the best Zinfandel on the planet and with the lamb it was a real no-brainer. Gulden Draak – Dark Triple Ale, rich dark flavors, a great beer to go with the onion soup. No need to hop on a plane to go on vacation for Parisian cuisine when you’ve got it right here in Studio City. It’s about as good as it gets. At the end of the day I do these reviews because I love the culinary experience. It’s really all about the food and how it makes you feel in the moment. Montresor didn’t disappoint, with so many culinary choices it’s hard to figure out what to try. But for me this was one of the best tastings I have done in a very long time, truly!! Montresor is French for “My Treasure”, and after you try the food here you will feel like you found your culinary treasure, I know I did!